Three attackers hurled grenades Friday at women leaving a church on the grounds of a Presbyterian hospital in Pakistan, killing three nurses and wounding about 25 people in the second attack this week against Christians. One of the attackers also died in the assault at 7:45 a.m. on the grounds of the hospital in Taxila. All the victims were Pakistanis, and about half were seriously wounded, police said. The attack is the latest in a series of terrorist incidents here since Pakistani President Pervez Musharraf sided with the United States against the Afghan Taliban, outraging extremists. "We have drawn the conclusion that a group of between 15 to 20 terrorists is actively trying to kill Christians and Westerners to express their anger against Pakistan's support for the United States in the war against terrorism," chief police inspector Raja Mumtaz Ahmad said. Ahmad said the group was believed to have divided into four teams to stage attacks in northern Pakistan. He said security had been stepped up at Christian churches throughout the country. Christians make up less than 2 percent of Pakistan's 145 million people, most of whom are overwhelmingly Muslim. "It looks to be the same chain of terrorists," said S.K. Tressler, the government minister in charge of minority affairs. "It is clear that terrorists are targeting the Christian community in Pakistan." The latest attack sent another shockwave through a Christian community still reeling from a raid on a missionary school for foreign children. "I thought it was a bolt of lightning," said hospital administrator Joseph Lall, who was slightly injured. He was still in the chapel building when the grenades exploded. Lall said it was usual at the hospital for the women to leave the church first. Male worshipers mainly escaped unhurt. Police said they believed the attack in Taxila, 25 miles northwest of Islamabad, was linked to an assault four days ago against a school for children of Christian missionaries in which six Pakistanis were killed. "It is clear that terrorists are targeting the Christian community in Pakistan," said S.K. Tressler, the government minister in charge of minority affairs. "The entire Pakistani nation will have to fight terrorism." Chief investigator Raja Mumtaz Ahmad told The Associated Press that the attackers wanted to kill Christians or Westerners to express anger over Pakistan's support for the U.S.-led war against terrorism. Church officials and diplomats say the recent attacks appeared to be aimed at Westerners rather than Christians. Church elders say militants view Christians as Westerners and Westerners as Christians. Yet in all four strikes on Christians since October, Pakistanis, not foreigners, suffered most. "Local Christians have got nothing to do with international terrorism," said Alexander John Malik, the Bishop of Lahore and the most senior cleric of the Church of Pakistan. "If they think that by targeting us they might change the policies of America and England, they are mistaken," he told Reuters. The attack occurred as worshippers were leaving a church on the hospital grounds, attended mostly by women and children, and women traditionally exit first. The three assailants, one of them brandishing a pistol, ran through the front gate of the hospital grounds, locked two watchmen in a guard booth, then rushed at the women with the grenades, police said. The explosions shattered windows and gouged two large holes in the pavement outside the church. Shoes belonging to some of the victims were seen scattered outside. Officials said one attacker died when a piece of shrapnel flew into his back and pierced his heart. Hundreds of onlookers gathered in front of the hospital's locked gates, while inside the hospital, women wailed and pounded their chests. Staff members hugged each other or stood in shock. "I was still inside the church when I heard explosions," said staff member Margif Tariq. "Windowpanes were falling on us, everyone was crying, everyone was in pain...When I came out, I saw dozens of women were lying on the pavement and most of them were bleeding." Erik Masih, one of the security guards locked in the booth, said he tried to stop the men but "one of them pulled out a pistol and pushed me inside the room." "I was inside the room for a few seconds when I heard the sound of explosions," he said. "At that moment, the man who was guarding me outside ran away toward the main gate." The hospital, which is supported by the Presbyterian Church USA and the Presbyterian Church of Pakistan, was founded in 1922 and treats mostly poor Muslim patients. Following the attack, outpatient services were suspended for the day. "We have been here since 1922, and someone throws a bomb," retired administrator Ernest Lall said. "I don't know why. It is somebody who must be against Christianity. We never thought we would be a target like that." Shah, the regional police commander, said he believed the assailants were linked to the Murree shootings on Monday because the attacker who died was wearing clothing similar to that of the school attackers. One day after the Murree attack, three men believed to have carried out the school raid blew themselves up with grenades after being stopped by police in Pakistan-controlled Kashmir. Before killing themselves, the three men in Kashmir admitted to attacking the school and warned that other groups like them "plan to carry out similar attacks on Americans and nonbelievers, and you will soon hear about it," Shah said. Extremists have vowed revenge against both Musharraf and his Western supporters since the Pakistani government broke with the Taliban and began a crackdown on hard-line Islamic groups. "If immediate steps are not taken by authorities to provide protection to Christians, I fear that it will lead to the start of genocide in Pakistan," said Shahbaz Bhaddi, leader of the All-Pakistan Minorities Alliance. "We strongly condemn this incident and we will definitely stage protests. We will not remain silent." In March, five people including the wife and daughter of an American diplomat died in a grenade attack on a church in Islamabad. 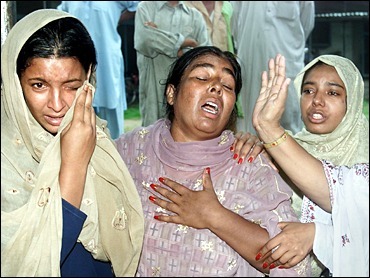 Last October, 16 Christians and one Muslim were massacred in a church in Bahawalpur in populous Punjab province. Attacks on foreign targets blamed on militants in the past year also include a car bomb in Karachi in May that killed eleven French engineers and three Pakistanis and another at the U.S. consulate in the city on June 14 that killed 12 Pakistanis.